Depending on the type of backup program you choose, you will be given the option to backup locally or remotely. In case of the former you will be presented with a file/directory selection dialog box, while if you decide to backup to a remote server, you will be presented with a form where you must enter the remote server's IP, port and path. In case of backing up to a remote server, you have to make sure there's IP visibility between both ESXi systems in the configured IP and port. The GUI will test whether there exists a remote folder at the provided path and return an error message, only if it can't find it. Both of the above windows allow you to set the --backup-point argument. When you have come to this point, you will be asked whether you want to backup a custom set of VMs, all running VMs or All VMs, no matter if they are running or not. All VMs means all VMs registered to the host and which are registered to the ESXi host. This form sets the --backup-type command line argument. If you choose "Custom" in the above screen, you will then need to select the VMs to backup from a double box selection form. You can select VMs by using the space bar or by clicking in the VM with your mouse pointer. Just select OK once you have finished your selection. This windows corresponds to the program's --backup-vms argument. Next screen corresponds to the --backup-how selection. 1/ Hot: this will perform a hot backup of the VMs, this means the VMs will be backed up while they are on and users may be accessing data in them. 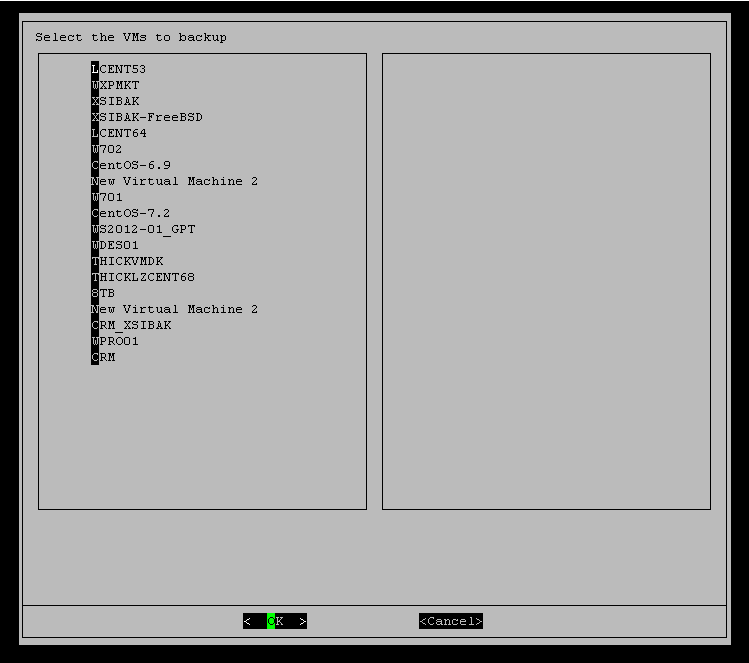 If you choose this method, then quiescing the VMs can be important in order to ensure data integrity, especially if the VMs are under havy load while the backup is being performed and the guest is running a database server, e-mail server, or any service that might be writing binary data to disk through some service. 2/ Warm: this type of backup is recommended if you want to backup an OS for which there aren't any WMWare Tools packages available. This backup method will switch off the VM, take a snapshot from the off state, which will ensure that the data contained in the snapshot is consistent, and then turn the VM back on. The whole process should not take more than some seconds, thus the backup of type warm is the recommended one if you can afford to have the VM off line for some seconds. Maybe 1 minute, or 1 minute and a half if you have many services in the guest that need to be put back online after the reboot. 3/ Cold: this a method you can use to put the VM in an OFF state during the whole backup cycle. XSIBackup will turn it OFF, back the VM up and turn if back ON once the backup has finished. It has no advantages over the Warm backup, except that no snapshot needs to be taken, thus the backup is maybe a bit faster. You can use this method to backup VMs that are in use only during business hours and can be turned off during the night. When you get to this part of the backup job setup, you will be asked if you wish to configure extended options. We'll leave this for the last part of the manual and explain them in detail. By now we'll choose "No, I finished configuring my backup job".